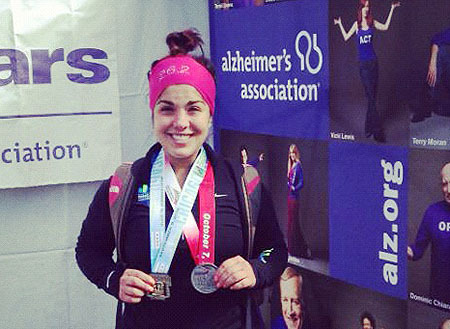 Monica Kucera raised nearly $1,000 for Alzheimer's research when running the Chicago Marathon. 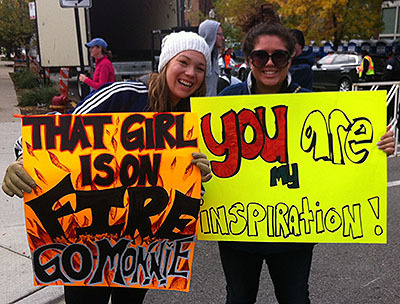 Editor's Note: DePaul senior Monica Kucera ran her first marathon Sunday. This is her account of what happened. Nine months ago, before any preparation even started, the day of the Chicago Marathon seemed centuries away. “I have time,” I said to myself while studying abroad in Greece. “Oct. 7… Oct. 7,” I thought. Time goes by fast, I’m sure anyone would agree. June 11, the first day of training, got here before I could even think about running. I laugh when I look back to this first week of training when the schedule alternated between three and four miles throughout that week. I laugh because I thought that was hard. Three miles at this point in time is easier than a walk in Oz Park. After a few weeks of training I decided to register for the Chicago Half Marathon with my running buddy and roommate, Lauren Kurash, since it fit in with our training routine anyway. Weeks went by and the Half Marathon came on Sept. 9. It was difficult, but overall, I got through it with a smile. I felt accomplished and couldn’t wait until Oct. 7, the real bread and butter of my marathon goal. In the first week in October, I was getting nervous and anxious for the day of the race. I really didn’t know what to expect. The most I had run before race day was 20 miles. After completing that, I was sore but not in extreme pain, so I expected race day exhaustion to feel about the same. I can now say I underestimated that by a longshot. I lined up in Corral E at 7:30 a.m. with Lauren and the rest of the ALZ Stars team that raised money for Alzheimer's research. Cold, nervous, anxious… I had many emotions going through my head. When I crossed the start line, nothing except pure adrenaline and excitement was running through my body. I cheered and ran with my arms in the air for the first 100 meters up Michigan Avenue. It was great that my family and friends came to support me. They were scattered throughout the race course, which was great because it was something I looked forward to. I honestly couldn’t have gotten through it without their encouragement. Valerie Pastwa (left) and friend Alyssa Ahern got creative. The first half of the race felt like a breeze. I vaguely remember running through all of the neighborhoods up to mile 17 with a huge smile. I remember thinking along the way, “Wow this is actually happening!” I might have looked ridiculous, but I didn’t care because I was so excited it was finally race day. After mile 20, I felt my body wanting to give up. That smile immediately turned upside down because I was almost afraid I wouldn’t make it. The miles felt like they got longer and longer. My feet kept getting heavier and heavier as miles went by. Thankfully I didn’t trip and fall, because had there been any bumps in my way I probably would have landed on my face. I’ve never had a harder time picking my feet up off the ground as they dragged behind me for the last five miles. Through the struggle, however, I was thankful I had Lauren by my side reminding me why I did this in the first place. “Think of Pappou, Monica!” I forced a smile and trucked on. “You can make it!” she said. When we finally reached the sign with “100 M” written on it, the tears flowed. I was so very close to the finish, I couldn’t believe it. I crossed that line and nearly collapsed in tears. Tears of joy, of course. I’ve never felt more proud of myself than that very moment. I wore my medal with pride the rest of the day, everywhere I went I made sure it was noticed. I went to get the back of it engraved today at Nike Chicago. The back of the medal has sections for your name, place and time. For place I had them put, “who cares,” because honestly, it wasn’t about the race it was about finishing. The place doesn’t matter, the self-gratification does. While the tears disappeared, the pain stayed. I chuckle when I try moving faster than a snail's pace because I look like an 80-year-old woman trying to walk. The pain in my legs and blisters on my feet aren’t going anywhere for a couple of days. I can gladly say it was worth all it, every 26.2 miles of the way.